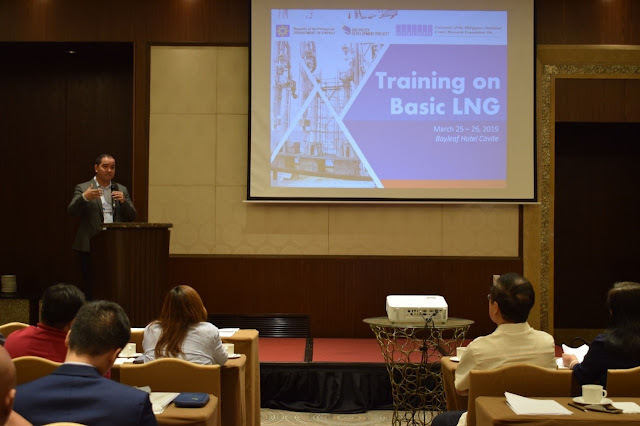 KNOWLEDGE IS POWER: DOE Assistant Secretary Leonido J. Pulido III stresses the importance of the Basic LNG Training and encouraged participants to take advantage of the opportunity to learn more about the natural gas industry. Members of the Department of Energy – Oil Industry Management Bureau led by Assistant Secretary Leonido J. Pulido III, held a two-day training program on Basic Liquefied Natural Gas (LNG) last 25 and 26 March 2019 as part of the Gas Policy Development Project (GPDP) of the DOE and the University of the Philippines – Statistical Center Research Foundation, Inc. (UP-SCRFI). The program provided a basic understanding of key concepts of the LNG value chain, the Philippine Downstream Natural Gas Industry Regulation (PDNGR), as well as the technical assistance to be extended by the GPDP relative to the implementation of the PDNGR. Energy Secretary Alfonso G. Cusi expressed his support for the knowledge and capacity-building activity given the crucial role of LNG in the country’s energy supply. “It is important for the government to keep cultivating a strong partnership with the academe. Their expertise and perspectives are crucial in helping us develop effective strategies in meeting our energy development goals, especially in light of Malampaya’s forthcoming depletion. We need to gain a deep understanding of the LNG for us to fully harness its potential as an energy resource,” Sec. Cusi emphasized. Representatives from various LNG companies such as Cheniere, Japan’s Energy for a New Era (JERA), Golar LNG, and Osaka Gas were among the resource speakers for the training program. Other government agencies that were represented in the workshop included the Senate, the House of Representatives, the Department of Labor and Employment-Bureau of Working Conditions, the Maritime Industry Authority, Bureau of Fire Protection, the Environmental Management Bureau, Philippine Coast Guard, as wells the Health and City Engineering Offices of Batangas City. Together with other industry stakeholders, the participants engaged in a dynamic discussion on relevant Philippine laws, policies and regulations, and other technical processes required for the establishment and operations of LNG facilities. Inputs from the discussions will be used in the formulation of natural gas policies and in the development of a comprehensive resource document on LNG in the Philippines. The GPDP is being implemented by the United States Department of State under the US-Asia Enhancing Development and Growth through Energy initiative. ONE FOR NATGAS: Participants gather for a photo on the last day of the two-day training program.